There are a few things to consider when setting up your FIFA Ultimate Team Squad. Player Rating and skill will only get you so far, because Chemistry is really where its at. Chemistry is essentially a measure of how well your players will work together. It's a value that has a direct effect on your team's overall rating, with poor Team Chemistry lowering your rating by a fair bit. 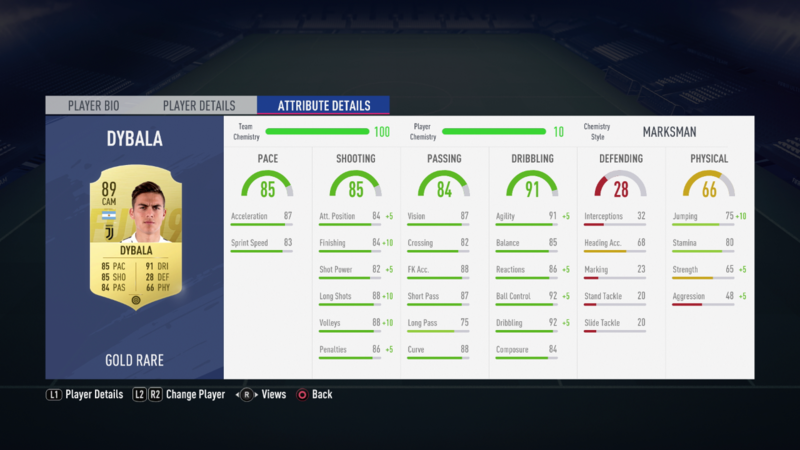 In this FIFA 19 Chemistry Guide, we've pulled together everything you need to know about Chemistry in FUT 19. We'll break down exactly what affects Chemistry, and what the best ways of increasing it are. For more on FIFA 19, head on over to our FIFA 19 Guides Hub. It’s full of useful info on FIFA 19, like how to score lots of goals in FIFA 19, what the best young players are, and more. 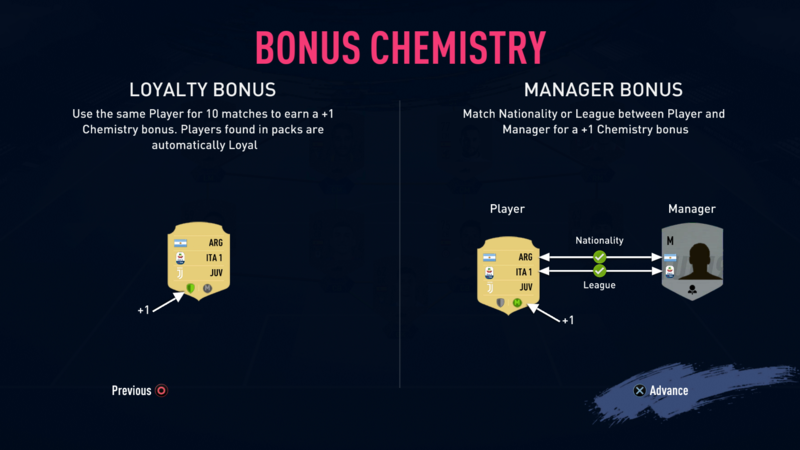 Getting your head around Chemistry in FIFA 19 can be a little tricky, even with the help of the brief in-game tutorial you'll be guided through when starting up FUT 19. The minutia of how Chemistry is calculated is pretty calculated, and you're welcome to dig deeper into the maths if you'd like. Generally though, keeping the basics in mind will see you through, so be sure to check out the info below to ensure your Chemistry is always as high as it can be. In FIFA 19, Chemistry is a measure of how well your team works together. There are two values to consider: Team Chemistry and Individual Chemistry. These values interact and are totalled at the top Right of the squad building screen. You’ll want to aim for the highest value you can, though 80+ is a good place to start. 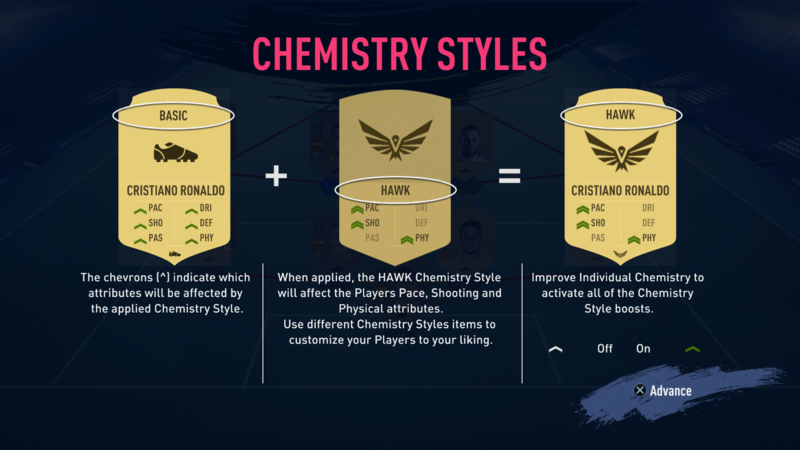 FUT Chemistry can be categorized into three separate sections. We’ve listed them below, and given you some info on how to check player Chemistry in FIFA 19. Individual Player Chemistry - Player Chemistry is rated between 1 and 10. You can press the Right stick while hovering over a player to see how their chemistry will change when applied to the team. There are “+” or “-” values next to individual attributes which show how they will improve or worsen depending on the change in chemistry. Team Chemistry - The FUT 19 Team Chemistry is displayed in the top right of the screen and shows a value between 1 and 100. Overall Chemistry - Calculated using the total of each individual player Chemistry, and Team Chemistry, we’ll go into more detail below. When building a Squad in FUT 19, Chemistry should be one of the first things you use to pair players together. It's all well and good filling your team with the best players in your club, but if Chemistry is poor, they'll be seriously penalized. 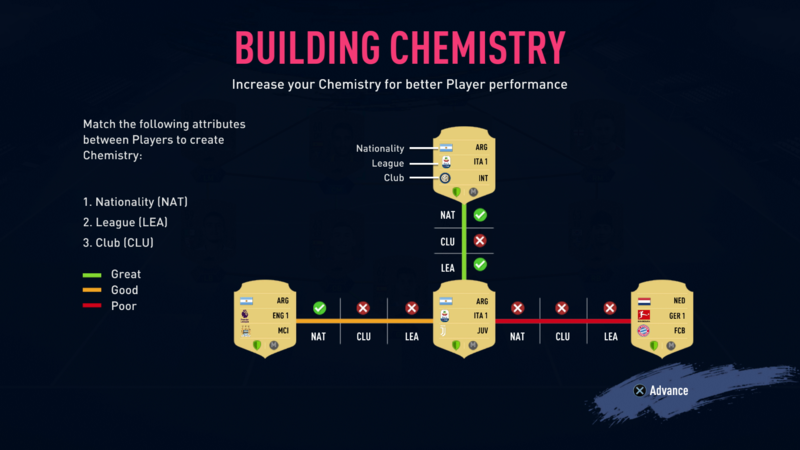 Increasing Chemistry in FIFA 19 is pretty straightforward anyway, as there's only really three basic principles you need to keep in mind, as well as a few modifying factors. We've listed everything you need to know about increasing Chemistry in FIFA 19 below. Links between players - In the graphic below, you can see the factors that determine chemistry between two players. They are three-fold, involving a player’s league, club, and nationality. Matching none of these things yields a red line that connects the players (indicating low chemistry). Matching one of these factors will yield an orange line (good Chemistry). Matching two or more of these three factors will result in a green line connecting two players (Great Chemistry). Player Position - Having a player in the right position will increase Chemistry significantly. If they are in the wrong position, they’re position icon will be red. If they are in a position that they can reasonable play in, but one that is not ideal, it will be orange. Matching a player to their ideal position on the field will show a green icon. Loyalty- One of the easiest ways to add a chemistry boost to a player is to play them for ten matches. They’ll then receive a boost of one point to individual chemistry, indicated by a green shield on the back of a player’s card. Manager - Matching the nationality or league between manager and player will boost the player’s Individual Chemistry by One Point. Chemistry Style - Chemistry Styles improve specific player attributes. You can read more about them in our FIFA 19 Chemistry Style Guide. While the methods listed above will cover you for working out the chemistry of your team, you can get more granular with it. 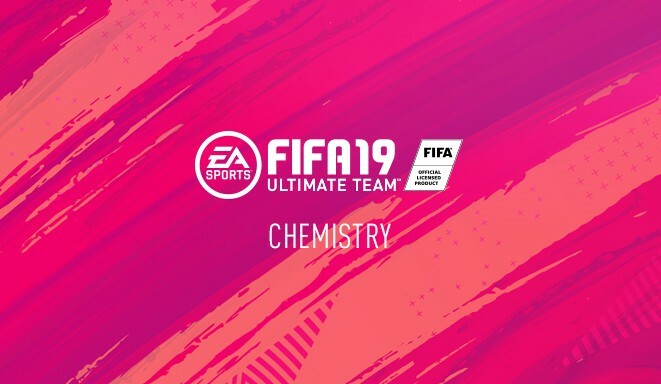 EA has revealed how Chemistry is calculated in FUT 19, and it’s slightly different than last year. Let’s take a look at the key details. Player Chemistry of 5. Thus, their individual chemistry is: 25% from Team Chemistry and 75% from Static Individual Player Chemistry of 5. This means that, while substitutes benefit from being in a team with high Chemistry, they won’t receive the effects of Individual Player Chemistry. If the resulting number is greater than 50, players’ attributes which are affected by the active chemistry style start to improve towards their maximum value. If the boost from this value would increase a player's attributes above 99 the boost will cap at 99. So you've spent hours ensuring you've maxed out your chemistry in FIFA 19, only to have to sub in some players during a game. Well if you're worried about messing up your FUT 19 Chemistry, fear not. When you bring in a substitute, they will have a fixed player chemistry of 5. Thankfully, you can make changes to formation, position and tactics in game without having to worry about chemistry. Use this to your advantage, setting up high chemistry before a game and then swapping in some better players. Using the FIFA 19 Web App can be a great way to swap and play around with your team to maximize chemistry. You can see things like nationality and league much more clearly, so finding some time to experiment is key. It also helps to have a cursory knowledge of the league your focusing on is also a great way to make the most of your time with FUT 19. We're not saying you need to know the attributes of every player in the game, but if you're building a team around La Liga, then it pays to know the best players, so that you can immediately spot a great deal.